Cracking and preparing bay nuts to roast. After roasting, these powerful nuts have the flavor elements of dark chocolate and coffee beans. The energy buzz follows. A salad of all Native greens from the oak woodlands of our homeland — spicy watercress and sweet sorrel with juicy blackberries and gooseberries. We add fiddleheads sautéed in walnut oil with SF Bay salt, hazelnuts, walnuts, popped amaranth + dress our greens in walnut oil and elderberry juice. Members of the Muwekma Ohlone Tribe enjoy a bite at Cafe Ohlone. 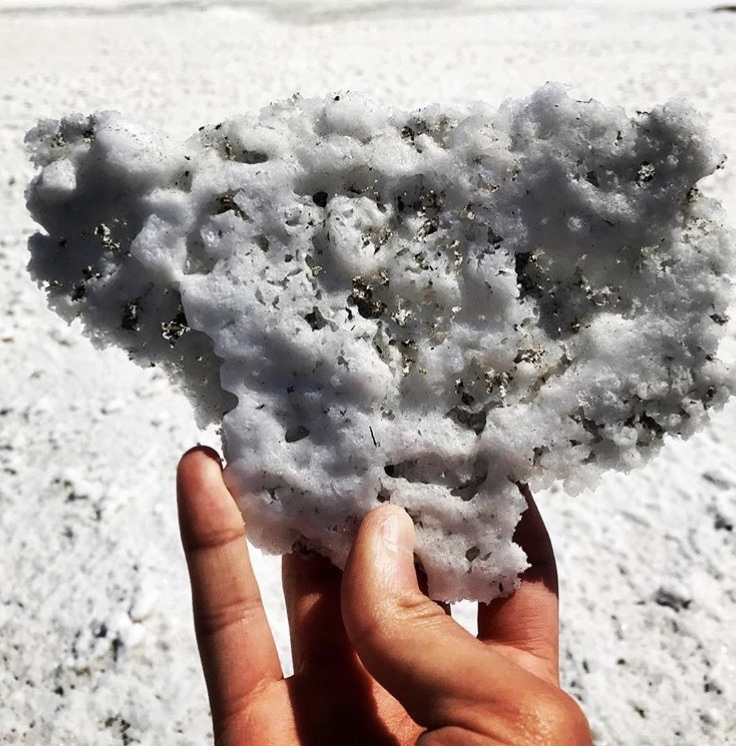 A beloved, culturally-rich mineral that keeps the bayshore in the dishes we prepare — we gather our salt as our people have always done along the East Bay shoreline in the pickleweed marshes where geese, clams, herons and egrets thrive, and nearby where many of our people still live. Venison backstrap cooked with bay laurel and yerba buena, blackberries, mushrooms and bitter greens. čawrišim — in the Rumsen Ohlone language — also called Yerba Buena, is a special minty herb that grows throughout many Ohlone homelands. It is used heavily in our cooking + for fragrant tea. Ohlone berries, readily available in the warm summer months, are a major component and flavor of our traditional diet. Photographed are huckleberries, wild strawberries + blackberries. Beloved, beautiful + delicious speckled quail eggs have been gathered + cherished by Ohlone people for countless generations. 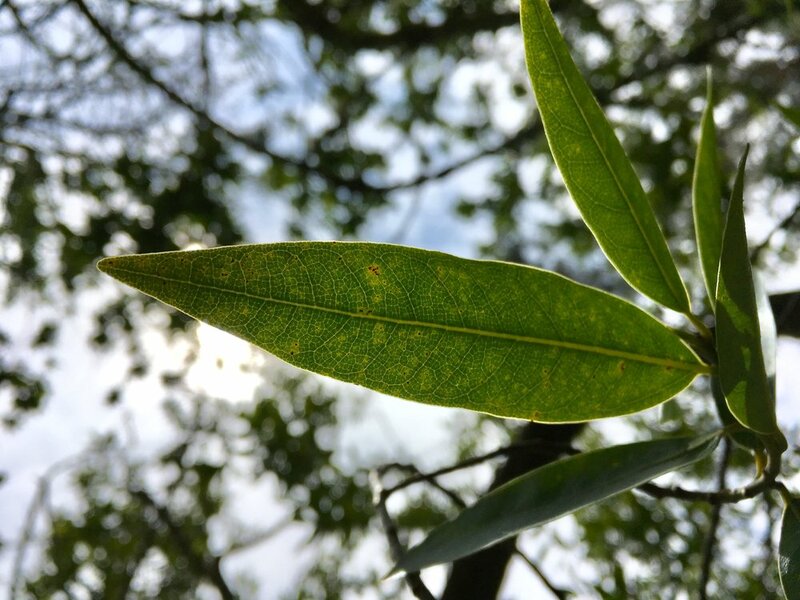 Fragrant, spicy, oily + rich bay laurel is a quintessential Ohlone flavor and implemented in many of our foods. Delicious, nutty, nutrient-rich acorn flatbread for power. Free of western grains and can be served savory and topped with mushrooms + meat, or served sweet with honey and local berries. Photographed in the tribal area of tuibun, in the area encompassing Coyote Hills in Fremont, are blooming poppies reminding us of the beauty and abundance of our homeland. Crispy duck breast roasted with local bay laurel. Served with two Ohlone berry sauces: one with blackberry + yerba buena from summentak in the Carmel Valley, and one made from wild strawberry + bay laurel from saklan in the Berkeley Hills. Served with local mushrooms – golden chanterelles and + oyster mushrooms – and garnished with toasted pine nuts + popped amaranth. Our beautiful land. A reminder of where we come from. The tribal area shown is saklan, on the eastern side of the Oakland-Berkeley hills. Grilled venison cooked with crushed blackberries + yerba buena, diced local mushrooms. Topped with duck fat sautéed dandelion greens, served on top of savory hazelnut butter-smeared acorn flatbread. 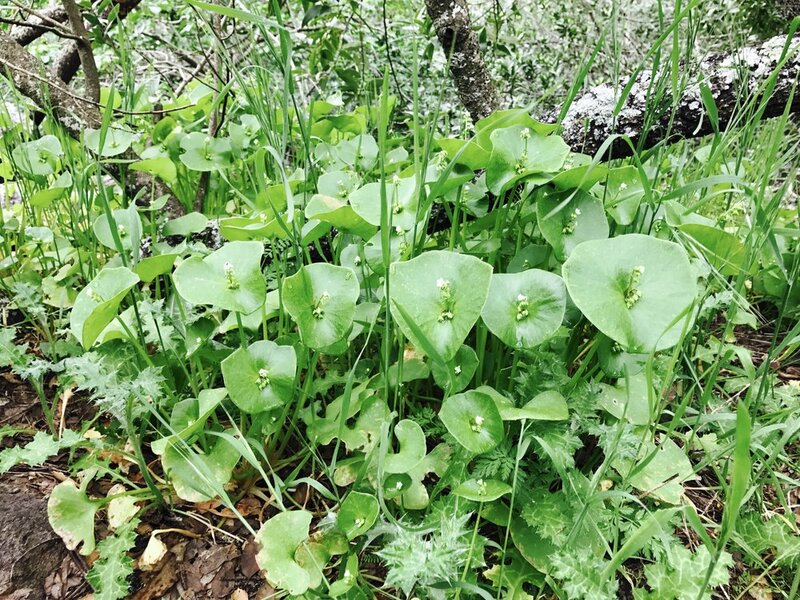 Indian lettuce that is used heavily by Ohlone people – historically and presently. It has a delightful, fresh, earthy taste. The power we descend from. Ohlone children eating acorn bread, powerful + cherished food. Blackberries slowly cooked down with bay laurel + yerba buena melds flavors of our homeland together in a fragrant sauce that pairs well with duck + venison. Traditional Ohlone clamshell beads + currency. Beloved, crunchy + salty pickleweed is gathered in the mudflats of mak-'omuxtka (SF Bay), in the living Bay coastline where traditionally tule boats paddle off the coast, shellfish + salt are gathered, and shellmounds soar. Local mushrooms from the Ohlone woodlands – oyster, chanterelle + morels. Louis (mak-'amham co-founder) in the saklan tribal area, beautiful Indian land behind the Oakland hills where the redwoods soar. 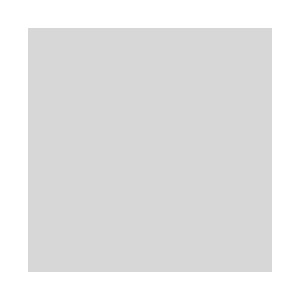 This is how we say "it's good food" in the Chochenyo language, the indigenous language to the East Bay. Recorded in 1921 in Pleasanton by Angela de los Colos, a savior of the Chochenyo language. Rich venison slowly cooked with bay laurel, yerba buena, local chanterelles + oyster mushrooms. Protein-rich acorn soup – full of monounsaturated fats, good oils, fiber. Lightly sweetened with honey and walnut milk. These powerful, rich balls are made from roasted bay nuts that have been processed in a mortar. They have the consistency of a rich chocolate truffle, and the flavor notes of spicy bay, unsweetened chocolate + coffee. They give you an energy kick that lasts, too. Waving cattails along the powerful, living SF Bay. Growing in the mudflats where salt, pickleweed, and shellfish are gathered. Local mushrooms – golden chanterelles + oysters – typical and rich Ohlone mushrooms from our woodlands. Cooked with peppery bay laurel and sea salt. Topped with toasted pine nuts and popped amaranth seeds. Yerba buena slowly cooking releases the minty, lemony flavors of our Ohlone homelands. California buckwheat is gathered in our homeland and processed to make grain for these fluffy, earthy and delicious pancakes we top with huckleberries, walnuts + honey. 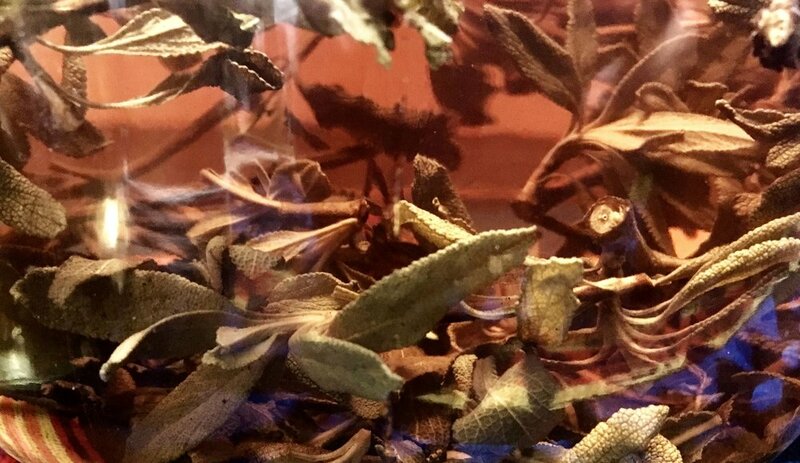 Black sage tea, herbal + rich, represent one of the many Indigenous beverages of our home. Closely looking at the Earth for minty yerba buena with a beloved elder from Louis Trevino’s Rumsen Ohlone family. Our artwork fills the space at Cafe Ohlone; on the back wall is a traditional basket design painted in goat milk, with clamshell and abalone pieces that that are meant to invoke hanging basketry adornments that are common in Ohlone baskets. Delicious, local valley oak acorn flour is baked into sweet balls of acorn bread; firm on the outside and with a pudding-like consistency on the inside, this method recorded in Rumsen Ohlone documentation from the 1930s allows us to make this rich, traditional power food again. Elegant dinners under the stars at Cafe Ohlone alternating Saturday nights.